With a gold star, a donkey’s ear and a cow’s horn, Hayes has written an English/Spanish version of a well-loved fairytale. ArcÃ­a convinces her widowed father to marry their next door neighbor, a widowed mother of two daughters. He resisted saying “Today Margarita is so sweet and kind, But her sweetness will turn bitter with time.” Eventually they married and things were fine until ArcÃ­a’s father left for the mountains with his sheep. Margarita did not like ArcÃ­a any longer and soon ArcÃ­a was relegated to the kitchen to sleep by the stove. When ArcÃ­a’s father returned he gave each girl a sheep to tend and whatever money they made was theirs to keep. ArcÃ­a had her father shear her sheep for wool. While she was at the river washing it, a magical hawk swooped down and took her wool. When ArcÃ­a looked up at the hawk’s urging, a gold star fell to her forehead. ArcÃ­a’s sisters went to the river but were rude to the hawk and wouldn’t look up. Each girl received her reward—a donkey’s ear or a green horn on her forehead. A party was announced for girls from every village throughout the mountains so the Prince could find a wife. Everyone went except ArcÃ­a who sneaked down to the palace to look into the window. The Prince saw her and wanted to meet her but ArcÃ­a was frightened and ran home. When the Prince arrived the next day searching for Little Gold Star, he was only introduced to the two sisters. The cat, rubbing the Prince’s leg, told him there was someone under the table. The Prince met ArcÃ­a, fell in love and they married a few days later. The illustrator, Gloria Perez, died from cancer after completing only part of her work. She had explained to her daughter, Lucia, the colors she wanted used and after her mother’s death, Lucia, also an illustrator, completed the paintings. The paintings are detailed and are worth discussions in themselves. The warmth, brightness and earth tones of the colors are reminders of the Southwestern United States. 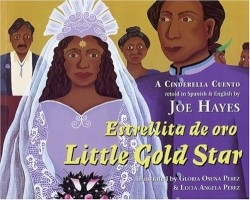 Little Gold Star is a shining example of how a culture has adapted the age-old story of Cinderella and is an excellent addition to the multicultural genre.